Respect and trust are commonly referred to as being earned. Other aspects of human interaction are sometimes included but only these two are held in quite this regard. We speak of both, in a sense, as social commodities. When doing so, it is often part of a critique of someone’s behavior being insufficient to warrant such credits. We also take this stance as a reminder to those who demand admiration or belief. Imagine if society had a literal system of accounting for behavior and personal qualities. If human interaction were directly comparable to an economy, what currency buys respect and trust? What can they in turn be used to purchase? Imagine this Confidence Exchange. Desire would drive this market just as it does real financial systems. Reputation plays a role in these hypothetical stocks in the same way real investments are effected. Given that forms of monetary transactions predate recorded history, the idea that we’ve been participating in the Confidence Exchange (and without knowing it as such) all along may not be far-fetched. Although coin and paper currency would come later, money existed before most early legal codes. Both Hammurabi and Ur-Nammu dealt with the role of money in civil society (among other matters, of course). The scales of the market were borrowed to serve as the near-universal representation of justice. There is then, still, an implied pessimism in the symbol – from back in the traders’ stalls where proof of a good deal was required by real measurement. Spoken language predates barter but for the entire course of recorded history our thinking has been driven by market-based factors we don’t spend much time considering. Case in point, how we spend our time, not to mention the idea that time is money, may have grown up with the economy more than any other aspect of civilization. There is no symbol for the intrinsic value of a person or society. There are no signs for loyalty or honor. The Anglo-Saxon and Scandic systems of weregild may have provided small, financial comfort in the aftermath of loss but the cost in coin could not reflect the nature of the person(s) lost. Religious symbols represent institutions, tenets, and adherents but rarely (if at all) any specific virtue. Where are these signs? It won’t catch on but I have an idea for a symbol for Hope and Optimism. On April 12, 1981, Space Shuttle Columbia stood on Launch Pad 39A. I was in my last year of high school and four generations of my family sat in relative silence listening to journalists and scientists trade jargon and speculation. They too fell silent when the shuttle began to rumble. With seven seconds to go, the hydrogen burn-off igniters made it look like they sparked the launch into being. For several minutes we sat without a word. My siblings and I hadn’t seen the Mercury, Gemini, and Apollo programs; everyone else in the room had. To them this launch seemed different. Human desires that had survived on little more than hope for 15,000 years were arcing into the sky. I was then and remain truly awestruck by that observation. It’s probably the only aspect of my point of view that has a timestamp. If the space shuttle is a horse-drawn cart how astonishing will the future be? So, I offer the space shuttle as a symbol of the value and virtue of hope. Marvel Comics announced last year that a female version of Thor would feature in a new storyline. Given that an African-American would assume the mantle of Captain America was announced at about the same time, it seems a reasonable suspicion that Marvel executives might have issued a “More Diversity” directive. 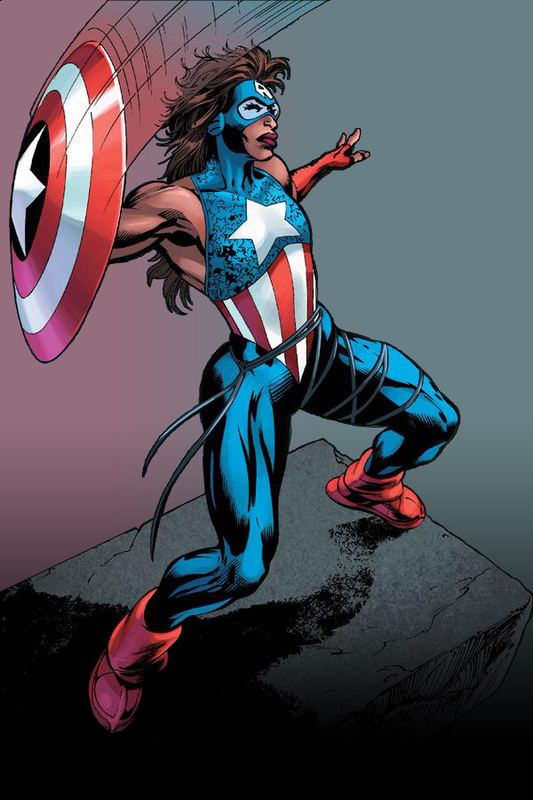 There was a degree of push-back on both Thor as a woman and Cap’ as a black man. I didn’t agree with the opposition to either character and still don’t. I’m very much in favor of stories that encourage an understanding of diversity. There is great value, particularly in entertainment that appeals to children and young adults, in a reader finding heroes that are readily seen as “like me” by said reader. This should not be limited to fiction either. The likelihood that I’ll meet Mr. Whedon to discuss this seems a poor one. As he identifies as an atheist, I’m not sure his negative reaction to Thor as a woman is the one in which I’d most be interested. There are practitioners of Ásatrú (i.e., those who actually do worship Thor and other members of the Norse pantheon) and I’d rather chat with them about Asgardians in comic books – should I ever meet any. A far, far distant second place would be actual readers of Thor comics. I was able to speak with a vocal protestor of the Thor-as-a-woman panic (who will be anonymous in this entry – as a courtesy). The objection boiled down to his confessed inability to glean as much meaning from a story when the central character is female. In essence, that renders every fictional woman an Unreliable Narrator. It would not be fair to suggest that this anonymous opponent of the female Thor went on to say the same lack of apprehension applied to true stories told by non-fictional women. He did not. And I hope not. Isn’t it likely that the gender and/or sexual preference of fictional persons is rarely the point of the work of fiction in which they appear? Tales are made of emotions, decisions, and words. English, unlike such languages of Greek and French, does not gender its words. Why, then, is our thinking so gendered? When we are defensive, what are we defending? And is it really under any attack? I learned in preparation for this post that the Thor-as–woman title is selling better than the Thor-as–man issues. It was also news to me that the Captain America of at least one fictional future is Danielle Cage (the daughter of Jessica Jones and Luke Cage, a.k.a. Power Man). I‘ll have to put Ms. Cage as Cap’ on my reading list.